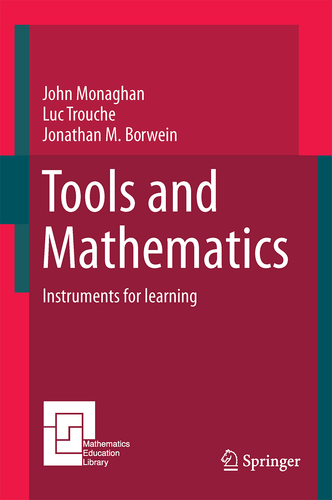 "Tools and Mathematics" is an exploration of tools and mathematics and issues in mathematics education related to tool use. It comprises five parts: the first part reflects on doing a mathematical task with different tools, followed by a mathematician's account of tool use in his work. The second considers prehistory and history: tools in the development from ape to human; tools and mathematics in the ancient world; tools for calculating; and tools in mathematics instruction. The third part opens with a broad review of technology and intellectual trends, circa 1970, and continues with three case studies of approaches in mathematics education and the place of tools in these approaches. The fourth part considers issues related to mathematics instructions: curriculum, assessment and policy; the calculator debate; mathematics in the real world; and teachers' use of technology. The final part looks to the future: task and tool design and new forms of activity via connectivity and computer games. Because the tools created and used in mathematics (from ruler and compass to computer-enabled visualisation) have such a large impact on both mathematical thinking both in research and education, we hope the workshop’s theme will be a common point of interest that will enable many further such creative collaborations. The workshop booklet is available as a PDF. The programme is now available below. Links to presentations will be added to it as they become available. The workshop incorporates a discussion panel on "Changing the way people think, move and feel mathematically: the contribution of digital technologies", with Paul Drijvers, Celia Hoyles, Ulrich Kortenkamp, Richard Noss and Judy-anne Osborn (details below), and plenary talks by Michael Assis, Michael Barnsley, Naomi Borwein, John Monaghan, Luc Trouche and Uri Wilensky. Paul Drijvers is professor in mathematics education at the Freudenthal Institute of Utrecht University’s Science Faculty. His research interests include the role of ICT in teaching, learning and assessing mathematics, algebra education, and teacher education. Paul has a background in pre-service and in-service teacher training and published numerous articles and books on mathematics education. He also works as a part-time research scientist at Cito, the leading Dutch testing and assessment institute. More information is available at http://www.uu.nl/staff/PHMDrijvers. Prof Dame Celia Hoyles is Professor of Mathematics Education at University College London Institute of Education. She was the UK Government Chief Adviser for mathematics, 2004- 07, the first recipient of the International Commission of Mathematics Instruction (ICMI) Hans Freudenthal medal in 2004 and the Royal Society Kavli Education Medal in 2011, both for research in mathematics education. One enduring research interest has been the design of computer environments to engage learners of all ages with mathematics. More information is available at http://www.lkl.ac.uk/cms/index.php?option=com_comprofiler&task=userProfile&user=91. Ulrich Kortenkamp is Professor of Mathematics Education at the University of Potsdam in Germany. He is working mainly at the intersection of Mathematics, Computer Science and Mathematics Education, trying to find ways to teach mathematics with and without ICT at all ages. Recent projects include research in teaching with digital tools in primary education and fostering creativity through digital tools in secondary education. He is external member of CARMA and serves as head of the department "Online Resources and Digital Tools" of the German Center for Teacher Education in Mathematics, DZLM. More information is available at: http://www.math.uni-potsdam.de/professuren/didaktik-der-mathematik/personen/prof-dr-ulrich-kortenkamp/. Richard Noss is Professor of Mathematics Education at the UCL Institute of Education. He was the founding director of the London Knowledge Lab, director of the government-funded Technology Enhanced Learning Research Programme, and deputy scientific manager of the EU Kaleidoscope network of excellence. Richard holds a Masters degree in pure mathematics and a PhD in mathematical education. He is an invited Fellow of the Institute of Mathematics and its Applications, a Fellow of the Academy of the Social Sciences and is a foreign fellow and medallist of the Union of Bulgarian Mathematicians. Richard was editor-in-chief of the International Journal of Computers for Mathematical Learning. More information is available at http://www.lkl.ac.uk/cms/index.php?option=com_comprofiler&task=userProfile&user=108&Itemid=111. Judy-anne Osborn is a mathematician interested in education, employed as a researcher and lecturer at the University of Newcastle. Judy-anne did her undergraduate (first class hons) and PhD at the University of Melbourne, where she joined ARC Centre of Excellence "Mathematics and Statistics of Complex Systems". Dr Osborn then joined the Mathematical Sciences Institute at ANU as a postdoctoral fellow, followed by a stint as a postdoctoral fellow at Newcastle in the University's Priority Centre CARMA (Computer Assisted Research Mathematics and its Applications) before taking up her present position. Judy-anne has a long-term interest in the notion of mathematics as an exploratory game. This notion influences both her research in combinatorics and her teaching. Dr Osborn has had a number of publications in well-regarded mathematical journals as well as several teaching-related grants, including leading the Newcastle node of a current OLT grant to improve the training of mathematics teachers. Many decades ago, Seymour Papert rose to the challenge of developing a theory and an appropriate language—such as objects-to-think-with, body syntonicity and aesthetic engagement—that could describe the way in which the use of digital technology changes the way people think, move and feel mathematically. Since then, the emergence of new digital technologies and new theories have helped researchers recognise the breadth and depth of that change and simultaneously provide a framework for the design and implementation of computational tools for learning mathematics. The possibility of putting mathematical objects into motion, for example, fundamentally changes the nature of these objects, how they are perceived and reasoned about; moving these objects changes the bodily actions and gestures of both learners and teachers; making the objects transform, collide and overlap changes the stories that can be told about them. Research on the use of digital technology has also provided an extraordinary "window" on mathematical meaning making, to use the metaphor provided by Celia Hoyles and Richard Noss, in part because of the visibility of thought, motion and feeling enabled in expressive digital technology environments. Like Papert, Jonathan Borwein recognised that the task is essentially epistemological not only psychological – nothing less than the construction of a new, computationally based mathematics. He often argued that computational mathematics is a "more honest" form of mathematics in that it "does not hide or obscure the experimental process by which a mathematical hypothesis is discovered". In the light of the above views, this panel will address the new ways people think, move and feel mathematically, thanks to the opportunities offered by digital technologies. Michael Assis — "Origami Mathematics in Education"
Michael Assis received his PhD in statistical mechanics physics from Stony Brook University in 2014 and is currently pursuing a research fellowship at the School of Mathematics and Statistics of the University of Melbourne. In addition to his recent research interest in applications of statistical mechanics methods to origami problems, he is an origami artist who has exhibited his work at various origami art conferences around the world. Michael Barnsley — "The tools of fractal geometry, 1978-2016"
Tools (specialist software, magnifying glasses, rulers, digital cameras) play a key role in the development of fractal geometry. Via experiments, typically involving pictures and algorithms, conjectures are made and tested, and theorems are proved. A famous example concerned early work on the the connectivity of the Mandelbrot set. Also applications are developed, for example, fractal image compression. In this lecture I will describe what seem now to be the most important tools I have used in fractal geometry, and the mathematics they have led to. Naomi Borwein — "From Lipschitz to Homo Habilis Mathematicus: a case study of Jon Borwein"
This talk surveys a spectrum of Jonathan M Borwein's expository writing on mathematics, creativity, and experimentation in academic and popular presses. From visualisation and intelligent computing as research tools, to comparative analysis of primary school math problems that go viral, these pieces reveal a serious and passionate engagement with mathematical education and culture, and a seemingly playful interaction with popular science and society, through intelligent design debates (ergo modern homo habilis mathematicus), mathematical history and philosophy (the humorous ontogeny of Pi is not equal to 22/7), the politics of financial maths (scientific fraud), and on. Indeed, Borwein's interdisciplinary approach is a guiding apparatus or paradigm for the trajectory of his research and didactics, where ‘accessible examples’ and ‘experimental approaches’ become his sharpest tools. John Monaghan — "Tool and mathematics — tools matter"
I will start my talk with a simple task, bisecting an angle, and argue the case that the tool we use to execute the task matters from the points of views of the mathematics involved in executing the task and what a learner may glean from the task. This will lead to a consideration of the import of Jonathan M Borwein’s work in mathematics and the use of computers in school mathematics. Luc Trouche — "From Scribal to Digital Schools, an Inspiring Journey in Mathematics (Education)"
Luc Trouche, after having taught mathematics in upper secondary school, then University, is now professor of didactics of mathematics at the French Institute of Education, Ecole Normal Supé de Lyon, France. a French-Chinese project, CORE-M (Collective and resources in mathematics), studying the notion of ‘expert teacher’ with respect to teachers’ collective work. He was president of the French Commission on Mathematics Teaching till September 1st 2016. Uri Wilensky — "Phenomena-based and Generative modeling — integration of computational math and science"
Uri Wilensky is a Professor of Learning Sciences, Computer Science and Complex Systems at Northwestern University. He is the founder and director of the Center for Connected Learning and Computer-Based Modeling and co-founder of the Northwestern Institute on Complex Systems (NICO). Much of his work has focused on the design of computer-based modeling and simulation languages, including networked collaborative simulations for both science research and math/science education. He is the author of the widely-used NetLogo agent-based modeling environment, the HubNet participatory simulation system, the NetLogo models library (which includes more than 300 agent-based simulations across a range of content domains), and numerous STEM curricula. He has an abiding interest in the changing content of knowledge in the context of ubiquitous computation, and its implications for making sense of complexity. He has published more than 200 scientific papers. He is the recipient of the National Science Foundation Career Award and the 2016 ISDDE prize for excellence in design. The workshop is free but please make sure that you register at Eventbrite. Abstract submission is now open. Please sign up on the abstracts page, where you can edit, save and submit your abstract. Note that this is a separate sign-up to the workshop registration. The workshop, hosted by CARMA, will be held at the University of Newcastle's Sydney campus (55 Elizabeth Street, Sydney). The room is ELI 122. "From Scribal to Digital Schools, an Inspiring Journey in Mathematics (Education)"
"Tools for Teaching Computational Mathematics"
"Sums, Products, and the Zeta Function: Visualizing a $1,000,000 Problem"
"Phenomena-based and Generative modeling - integration of computational math and science"
"Understanding Mathematics Teachers' TPACK through the Examination of Critical Instructional Events"